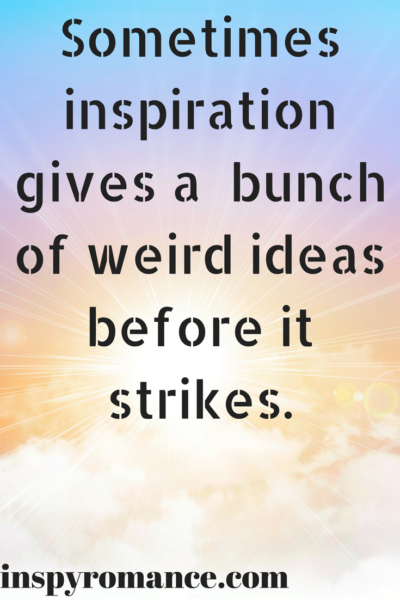 Sometimes I have trouble coming up with blogging ideas. It’s easy when I have a book coming out, but even that wears a little thin after a while. (Last month I told you about my upcoming April release…so it doesn’t seem fair that I talk about that release again in April, now does it? You don’t want to get bored reading this blog, and I don’t want to get bored writing for it.) So as my blogging deadline approached, I decided to randomly write down blogging ideas on a piece of notebook paper. Who On Earth Invented the Cronut? And Why? Some readers will love what you write. Some won’t. I get good reviews. I get bad reviews. I’ve gotten reviews from readers who disliked my book because it was about x, y, and z – even though the blurb clearly stated it was about x, y, and z. And I’ve had readers who have never left a review but who have contacted me through my website to tell me how something I wrote in my book spoke right to the heart of the issue they were dealing with and how thankful they are that God gave me that story because it was exactly what they needed. I’ve also had readers contact me just to thank me for giving them a good laugh. It’s not possible to please everyone. The world is filled with all kinds of readers who have different likes and dislikes, and that’s okay. Just because someone doesn’t like one of my books – that doesn’t mean they’re a bad person. It just means I’m not the author for them. I can live with that. At the end of the day, I want to be able to stand before God unashamed and know that I’ve written the story He gave me to write. Writing is a ministry. Or at least a mission project. I recently referred to my writing as a ministry, and I got a funny look from the person I was talking to. That’s when I realized not everyone has the same definition for ministry and if people misunderstand what you mean by that word, they can completely misread what you’re trying to tell them. So I’ve amended my statement. God has given me a ministry – but you can call it a mission project if you’re more comfortable with that. ^_^ Writing isn’t just about the book. It’s about the people, too. I’ve built relationships with readers, with other authors, with editors, with book promoters, and even with people who design swag. I have met so many people as I’ve pursued this thing called writing, and in each and every case, I believe that God has brought those people into my life intentionally…and that I should treat them with intentionality. In every single case, with every person that I come into contact with, it’s important that I remember I am Christ’s ambassador. It’s important that I love people right where they’re at and that I do my part to show them the love of Christ. 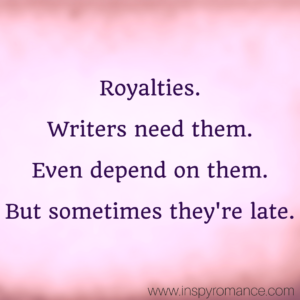 Royalties don’t always get paid on time. This is a reality of writing, and it hits both indie and traditionally published authors. It’s one of those things that I look at as a life lesson. Don’t spend the money before it’s in the bank. Don’t promise someone you’ll have their money on such-and-such a date because that’s when your royalties usually come in. Be smart. Be sensible. Understand that far too much of what goes on in this world is beyond your control. Don’t ask a teenage boy to pick out a book cover for a romance novel. God’s grace is sufficient. Always. Sometimes I make mistakes. (Shocker, right?) I say the wrong thing, misspell something on a social media post, or get words like sequins and sequence mixed up while writing. Mistakes happen. But God’s grace covers it all. The most important part is that I seek to serve Him with what I’m doing – from the writing to the social media – and that I do my best. If I’m seeking to serve God, and I’m doing the best I can, then I’m good. God is not standing by and waiting to drop the hammer on me over mistakes that, in the big scheme of things, are really quite small. This is a hard lesson for a perfectionist to learn. Not that I’m a perfectionist in every area of my life, but I’ve been known to put way more pressure on myself that is strictly wise. 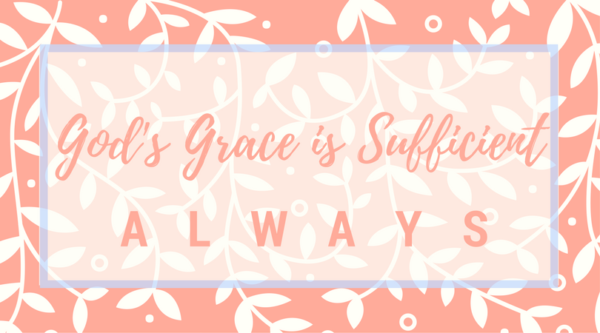 Living in the midst of God’s grace helps me to avoid doing that. Thank you for sticking with me and sharing a little bit of what I’ve learned from writing. I’ll be back next month to finish the list. In the meantime, can you tell me about an experience in your life that has taught you something profound? One random commenter will be selected to win a $5 Amazon Gift Card. “Teenage boys don’t make the best judges when it comes to romance covers.” This made me laugh, Heather. :) I’m looking forward to Part Two! Thanks for sharing, Heather. Also looking forward to Part Two. I really would love to reading your thoughts on Top Ten Things to Learn From Playing Cards With Your Kids. Our 3 year old granddaughter loves to play GO FISH. While she starts playing with the basic rules, by the end we play her rules. Regardless what phase of our lives, life is a learning process and God’s grace is sufficient. Blessings this Easter season. Happy Spring and Happy Writing. Thanks for sharing your experience as a writer. It was fun reading your brainstorming ideas and guessing how you’d connect those with romance. From all I’ve read, you’re definitely more than good enough to do that, but I’m still curious about how’d you do it. ;) It would be even funnier. As an avid reader (now recuping from back surgery), I enjoyed your post…..sorry you labored so with it…it is a winner! I ❤️ all of these writings. Thank you for visiting today, Ruth! Ministries are interesting things. God calls us to different places to be a reflection of His light. Not all of us are called to preach before groups. Not all of us are singers, or teachers of the Word. But, God needs “hands and feet” to take His ways into the lives of others, in as many ways as possible. Your writings show the love of Christ and the possibles for a person who has a relationship with Christ. As someone who is not a writer, I am so glad You are! Thank you so much Marcia! And how beautifully stated. You’re absolutely right. We’re all to be His hands and feet, but we’re not all called to walk the same path. Blessings! Teenage boys picking covers for romance novels…LOL! Here’s what I think: always put a horse on the book cover. You can’t go wrong with that–both sexes find them romantic. Heather, I’m with the others who said that your comment about teenage boys and romance book covers made me laugh. Lol on your son and the cover choice. I have enjoyed your stories I’ve read and find them both humorous and well plotted to keep those pages turning, and I get that writing is a ministry. You never now who you will reach with your writing. As far as something profound I’ve learned. I’m really not sure. I’m so glad you could stop by today Andrea! And thank you for the kind words! Great post! As a reader I have learned that each writer has different giftings, different ways that they are lead, different writing styles, different choices they make. I have found that I can be greatly blessed by being open to seeing what God has put on each author’s heart, and seeing how each author is gifted. I read to be encouraged, to relax, to laugh, to learn, and even to try to solve mysteries. The written word is a precious thing to me, as are the various author’s giftings. I also feel like the authors usually pour their hearts out in their books, so I always try to treat them carefully. I can truthfully say that I have been greatly blessed by a wonderful group of authors!! Thank you! You bless my heart, Becky. It’s good to know that there are readers out there who are looking to be blessed by each author they read. Hugs! thanks for sharing your insights about writing. I love that authors and readers can connect through stories. Thanks fir sharing with us . I’m glad you could stop by today Deana! As an author, I love to connect with readers! It’s such fun to see what’s going on in their lives and to learn the different ways that my stories have intersected with them. great interview and thanks for the laugh too! LOL! I loved every single thing about this post! Yes, I consider my writing a ministry too, so I try not to worry about poor sales or the occasional bad review. If God asks us to write a book and His plan is for it for only reach one specific reader, we’d better go with it! Heather, you make me laugh! When I think about teenage boys choosing a cover, I have to laugh out loud. You are so encouraging and honest in your messages. One experience, of many, in my life that has taught me valuable lessons is when my Mother was living in a nursing home. Daily visits with her allowed my family to meet other residents who didn’t have family or friends to visit. So we would always visit with as many people as we could. Cherished friendships were formed. That IS a profound lesson. Being alone in a strange place and not having visitors – it’s so hard on morale. I’m glad you and your family took time to visit the other residents and that you formed those relationships. What a beautiful testimony of being God’s hands of feet, of letting Him use you. Hugs!! Your post resonatedin many ways for me. As always, thanks for writing and seeking to deserve God in it. That is a huge blessing for me. I just retired from doing 30 years of in home day care. (We also sold our house and drove two cars for two days to my sons house. Next week we’ll land at my daughters house while we house hunt. ) I would describe my day care as a ministry, and some people gave me strange looks. As we were leaving, though, many, many former daycare parents and children thanked us. It was a blessing that they were blessed by it . I loved this and can’t wait for part two. I was laughing at the thought of your son being asked to pick which cover. One of the things that has taught me something is learning to water color at the age of 62. All my life I have failed at art and drawing When I was teaching Kindergarten and tried drawing pictures on the board, the kids would laugh at them. But I have always wanted to be able to paint. Last summer my friends were talking about taking a watercolor class at the Senior Center so I joined with great doubt I would be able to do it. But I have kept trying each week and now I am beginning to love the class and painting. The lesson I’ve learned is to be patient and keep trying. Don’t give up. We had a bit of a road trip this afternoon, and as we were driving along, this talk radio guy came on and started talking about Colonel Sanders. He was 65 when he decided to try to start selling the recipe for his fried chicken. He went all up and down the east coast trying to sell his recipe, and nobody was interested. He finally ended up in Toronto where someone showed an interest. Pretty soon more people showed an interest. Before you know it, a corporation reached out to him with an offer to take his recipe and franchise it…and Kentucky Fried Chicken was born. So 62? As far as trying new things goes, you’re spring chicken. ^_^ Never give up, especially when you’re walking the path God has for you. Hugs! Thanks for your post, Heather. I enjoyed reading it. I’ve learned from connecting with readers, writers, and bloggers on Facebook that you can form wonderful friendships with others without ever meeting them in person. How true! I’ve met friends, prayer partners, and more through online engagement with readers and other writers. It’s been fantastic! Thank you for stopping by today Kathy! I really enjoy reading your work and am looking forward to your next book! Several years ago while at work I realized that avoidance does not mean forgiveness (Profound #1). You probably know that, but it was like a brick hit me. I was talking with a co-worker and realized that I preferred not to interact with a certain client because of some history that I thought I had let it go. Apparently I hadn’t. I confessed to God and finally released the bitterness I didn’t realize I was carrying. Maybe you’re wondering why I wrote Profound #1 above? Well, I also learned that I had stopped compartmentalizing my faith (Profound #2). How else could God hit me with a brick? Thank you for sharing Julianne! Those are both amazing insights, but I’ll tell you – the one that excites me the most is #2 because that one – that’s going to lead you to all kinds of other profound spiritual insights. Hallelujah! What an amazing God we serve! After my father passed away it gave me a huge well of compassion for those who have lost a close loved one. Before that I didn’t fully understand how grief can affect a person. It also deepened my faith and gratitude for Christ. I understand what you mean Heidi. Going through a difficult time – or a tragedy – helps us to have greater patience, understanding, and compassion. I’m glad you’ve allowed God use that time in your own life to help you better reach out to and support others with love. I really liked your post. It was both profound and funny. I like the idea of writing as a ministry. My mom always taught me how our job can also be God’s calling to our lives and we should consider it as a ministry. I’m glad you could stop by today Laura! There’s a song (and wouldn’t you know it – the artist, title, AND lyrics completely escape me at the moment) that talks about how we’re to give God our very best in every moment. Whether we’re a stay-at-home mom, whether we’re a corporate executive – whether we feel like nothing we do matters, or whether we hold the livelihoods of thousands in our hands – everything we do needs to be done for Christ, and when we take that approach, then everything we do has significance beyond what we can see. Sounds like a great song! I would like to listen to it someday. About reviews; I write a LOT of book reviews since I am part of a vast amount of authors street/early read teams. What I’ve found, I may not always like the book I’m reading (thankfully VERY rarely) and if I can’t leave a positive review, I simply don’t. Then I will write that author and explain why, being honest, fair & non-hurtful in my email. There is never an excuse to be ugly to an author, in my humble opinion. If I don’t like a book, it’s not because of the author themselves, but most likely that particular book or writing style. I’ve also found some books by the same author I really love don’t resonate with me. It may be the book topic, theme or again, the writing style of that particular book. Any number of factors come into play for me! I’ve read a vast variety of books, subjects, themes, and styles to know what I like or don’t like. :-) But again, I really try to be fair and honest about them in my review. There have been very few times that I’ve left less than a three star review; and in those cases I make clear what I like first & then what I don’t like secondly. Being un-hurtful in my comments. And if I find I can’t say something in a nice way, I take my mother’s advice and don’t say anything at all! 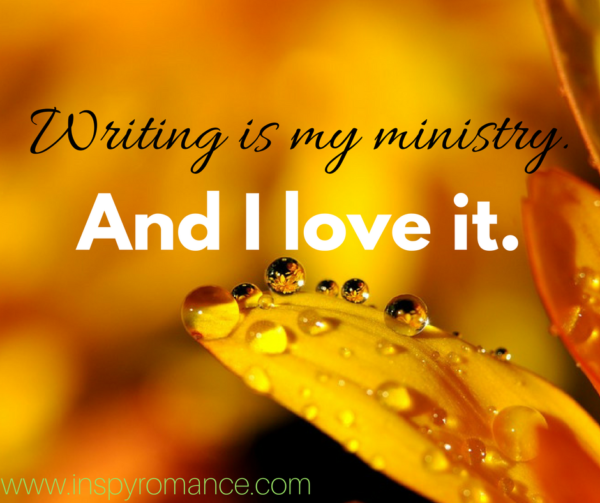 And as for writing being a ministry; I TOTALLY see it as that for writers! God can use anything in anyone’s life to speak to others. I think of writing a book as being able to reach vast hundreds of people with just one story. Write what God places in your heart to write, you never know what the reader will get out of it or how God will speak to them. God has used books in my life to encourage, challenge me, or just remind me of God’s promises in my own life. The neat thing too, God can use your ONE book to speak different things to each person. Like for example, I get one thing out of a book and someone else will get something totally different out of the same book. I think if we readers open our hearts & authors write what God wants them to, it’s a win/win for us all!! You have a great opportunity to be used by God to reach out to the world :-) Isn’t that an awesome thought to ponder? Thanks for a terrific post,I sure enjoyed reading it! On a different note; I TOTALLY agree with bakery doughnut being far superior to store-bought :-) It’s like being royally treated to a sweet treat. I NEVER by store bought….you could call me a doughnut snob…haha! One of the interesting things about using fiction writing to reach people is that Jesus Himself talked in story. He told parables. Jesus used the art of story to convey deep spiritual truths that changed people’s lives – that changed the world. I in no way, shape, or form compare myself to Christ – but I am deeply honored to be able to carry on the tradition of using story to deliver biblical truth into people’s lives. And how those stories touch people – you’re right. Stories touch different people in different ways. It’s part of the complexity and wonder that we all get to experience as children of God. He loves us all equally…yet has a deeply intimate and unique relationship with each one of us. And amen for that! It is interesting and fun to see the things you have learned from being a writer. One that really sticks out to me is “some readers will like your work and some won’t.” This is soooo true. I recently starting writing my own novel and that is a good thing for me to remember as I move forward. Not everyone will enjoy or even like what I write. But not everything is for everyone! :) Great post! Thanks for sharing your thoughts! I have a friend who says, “Not every shoe is going to fit every person.” It’s a fun way to remember that not every book is going to be a perfect fit for every reader. As long as we’re writing the stories God has given us to write, it’ll all work out. :-) Good luck and blessings on your book! I have learned that some people can be extremely cruel. When I meet someone new, I let them talk. Oh yes…I learned that my ex was sleeping with my best friend. I’ve been toying with ideas for several books. I’ve never written a novel lately, but they keep floating and rolling around in my head. Over the past few months I’ve hear several authors I admire talk about writing as a ministry and praying and hearing God’s voice about what to write. That’s really started sinking in, I think, and I’ve started asking God if he wants me to write and if so, what. I found your post very helpful with your thoughts on writing as ministry. I think there have been a lot of experiences God’s given me that are profound. The biggest one over the past few years is that life will not turn out how I want it to, but God’s plan is bigger. I’m still in a waiting area of my life, but He is beginning to prompt me in certain directions, like joining the prayer ministry at church. I’m trying to learn to hear His voice over my own.